Time Life Country Romance - Get a FREE Bonus CD When You Try this Collection of Amercian Classics from Country Music Superstars from TimeLife. As Seen on TV with Glenn Campbell. If you�re a sucker for the old classic country love songs, you don�t want to miss the amazing Time Life® Lifetime Of Country Romance CD collection, chock full of the classics that made us cry, laugh, and love. These original music recordings from the hottest American country superstars have been digitally remastered for perfect clarity and the deep, soulful sounds of the best country artists ever. With the Time Life Lifetime of Country Romance CD set, you�ll get 151 country romance classics spanning 4 decades of the music about loving, leaving, cheating, and laughing. Insert one of the 9 CDs into your favorite player and kick back with an old friend while the likes of Don Gibson, Ray Price, George Jones, Eddy Arnold, Sonny James, Conway Twitty, Glen Campbell, Randy Travis, Marty Robbins, Johnny Cash, Elvis Presley, Hank Williams, Buck Owens, Charley Pride, Jim Reeves, Patsy Cline, Dolly Parton, Kenny Rogers, Tammy Wynette, Linda Ronstadt, Bill Anderson, and many, many more regale you with their melodic country croons and tunes. The TimeLife Lifetime Of Country Romance collection comes with complete liner notes filled with photos and stories about the songs and the artists who made them famous; and the entire set comes in a striking collector�s box that you�ll be proud to show off to other country music aficionados. You�d spend countless hours and hundreds of dollars compiling this amazing country romance music collection on your own. Order right now and you�ll also get the bonus CD �80s Country Love Songs � full of hit songs by artists like Anne Murray, Randy Travis, Dolly Parton, Crystal Gayle, and more � absolutely free. That means you get a total of 151 songs spanning 4 decades on 9 CDs � complete with liner notes and collector�s box � for one low price. 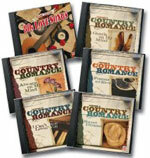 The unbeatable Time Life Lifetime Of Country Romance collection is not available in stores, so order yours now! Use the links below to find the best deal on Time Life® Lifetime Of Country Romance.